From Atlanta, Georgia, Ian Riccaboni, Caprice Coleman, and Colt Cabana called the action this week. John Skyler, Corey Hollis, and Josey Quinn were in the ring to start the show. Skyler said they're the toughest three-man team in Ring of Honor, which brought out Villain Enterprises. Marty Scurll took the microphone and told them that they were about to feel the wrath of Villain Enterprises. A brawl ensued before the match began. Villain Enterprises took control. After the break, PCO went for a flip dive but ended up landing on the apron. He hit the apron, then the floor, and then popped right back up. In the ring, Hollis took over on Scurll. They isolated Scurll and put a beating on him. Finally, Scurll fought out and landed a tornado DDT and made the tag to King. He tagged Scurll back in and the two used some tandem offense to put down Skyler. Scurll and King were back in the ring and put the finishing touches on Hollis. King hit a gonzo bomb and Scurll locked in the chicken wing for the submission. Just as the celebration began, red balloons appeared from beneath the ring. 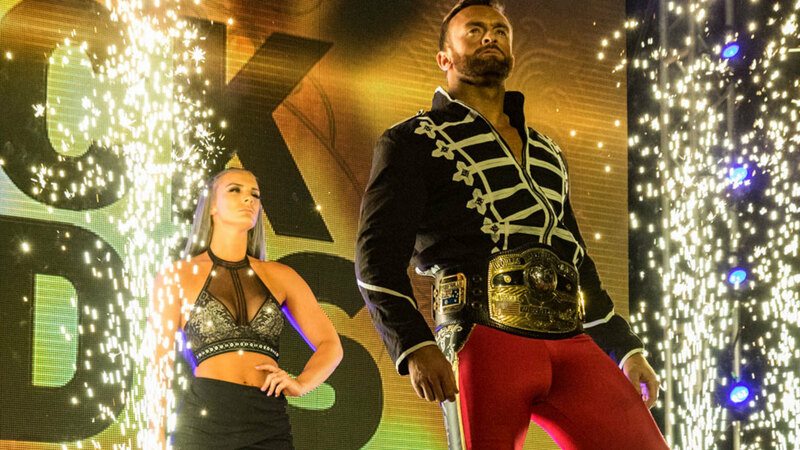 The Kingdom were on the stage, and they told Villain Enterprises that The Kingdom are the greatest three-man team -- and if Villain Enterprises want a shot at the gold, they’ll have to wait. Some classic chain wrestling started this NWA title match off. Aldis took a break and laid across the ropes. Each man got the edge and the other called for a timeout. Black went for a handshake mid-match and declared there would be no more cheating, but his fingers were crossed behind his back. He used a leg sweep to knock down the champ. Aldis found the advantage and whipped Black into the corner, but Black popped up and used a headscissors to send Aldis to the floor. Back in the ring, Black used a blatant eye poke, then went to the top rope. Kamille got in the way, so Black backed off. After the commercial, Aldis turned Black inside out with a lariat. A big backdrop to Black led to just a two count for Aldis. Both exchanged chops. Black went up top and landed a single axe handle. He went back up again and landed a double stomp but only got a two count. Black went up a third time, but Aldis got out of the way and managed to hook in a German suplex, and he followed that up with a powerbomb. He looked to put on the Texas Cloverleaf -- but Black rolled through. Black went up top again, but Aldis cut him off and launched Black with a German off the top rope. That still only earned him a two count. Aldis then went up top, but Black went up as well, snapped off a hurricanrana, and followed it up with a moonsault, but that wasn’t enough to keep the champ down. Black hooked in a dragon sleeper, but Aldis used his strength to pick up Black and land a Tombstone piledriver. Aldis went up top and hit an elbow drop, but Black kicked out at two. Kamille threw the NWA title belt into the ring and distracted the referee. Black got the belt, tossed it to Aldis, and faked like he got hit with the belt. The ref didn’t disqualify Aldis, but it allowed Black to try a roll-up for a two count. Aldis went outside and Black looked to hit a running kick through the ropes, but Aldis bailed and Black hit Kamille. Finally, inside the ring, Aldis was able to lock in the Texas Cloverleaf and Black had no choice but to tap out. Juice Robinson came to the ring and told the fans they would be seeing a lot more of him in an ROH ring in the future. He then declared that it was a new beginning for ROH. The lights went out and Tracy Williams, Bandido, Tenille Dashwood, Mark Haskins, and David Finlay were in the ring with him. Robinson declared their group is known as LifeBlood.